Since Monday, I’ve found what seems to be a WordPress knight on a white charger, and tech Hell has resolved itself into a much more pleasant spot, more like tech Heck. Still, I needed a walk on the beach today like someone lost in Death Valley in August needs a cold drink. At the beach, I saw a Great Blue Heron perched on a rock by the water. All that remained of the winter shore birds were two female Buffleheads, soon off to northeastern B.C. to nest in cavities made and later abandoned by Northern Flickers. And we think we have a tough time finding housing. 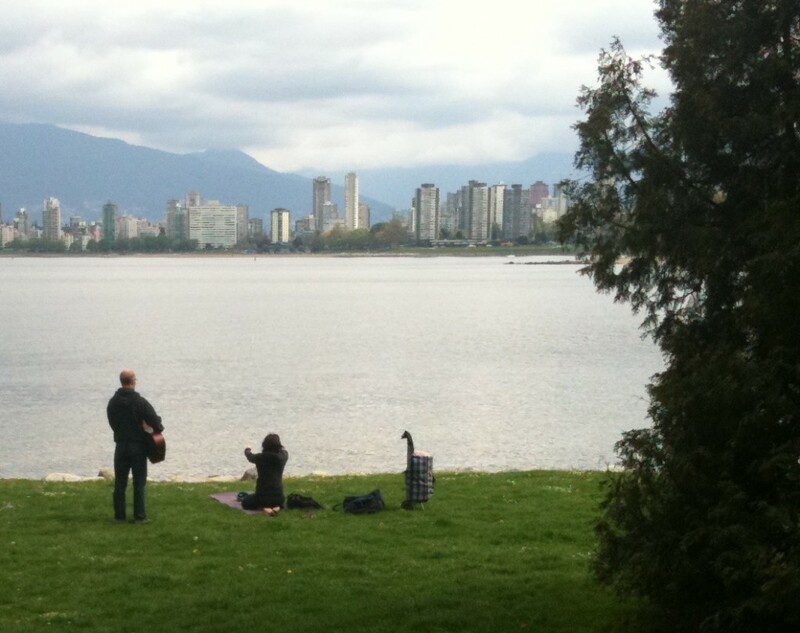 I also saw someone doing an outdoor yoga practice, with guitar accompaniment. I took a picture but didn’t intrude further. His music was reflective and calm. Her practice was just beginning, and she looked absorbed in it. Here’s the photographic evidence: let no one doubt that this is a yoga city. Vancouver is home to the anonymous Yoga Spy, whose blog today is a careful consideration of the pops and cracks you hear in yoga classes, and, more to the point, in your own body when you do certain poses. It’s a post worth reading, especially if you’ve ever heard a loud pop from your hip, or a series of clicks from your spine and wondered what was happening and whether you ought to be pleased or concerned. I hope to be back on schedule with a new Five-Minute Yoga challenge on Monday. See you then. And what’s your take on those sometimes satisfying, sometimes startling cracks and pops, Eve? Waitaminute, let me pull back my shoulders and gently arch the thorax for a little release… Ah! About the Wordpress savior: Don’t you love when people are truly good at what they do? In their element? To me, they are real-life examples of karmic lives, exemplifying the Bhagavad Gita’s point about wholeheartedly doing your “duty.” Some people go through the motions of their work, their relationships, their lives without caring enough to do anything well. Others go that extra step and it makes a huge difference. Not just to them but to the rest of the world. Including new bloggers (me included) stymied by techno glitches! Love the image. Very Vancouver. Those cracks? When they happen in my thoracic, when I’m doing a kitchen counter stretch, or in my back when I’m in deep twist, I love them. DIY physio.